Liu, M., Suo, S., Wu, J., Gan, Y. Hanaor, D.A.H., Chen, C.Q. (2019) Tailoring porous media for controllable capillary flow. Journal of Colloid and Interface Science. 539:379-387. Abstract: Control of capillary flow through porous media has broad practical implications. However, achieving accurate and reliable control of such processes by tuning the pore size or by modification of interface wettability remains challenging. 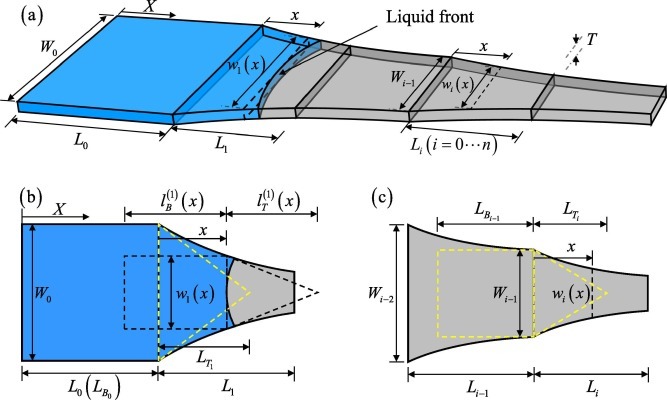 Here we propose that the liquid flow by capillary penetration can be accurately adjusted by tuning the geometry of porous media. On the basis of Darcy’s law, a general framework is proposed to facilitate the control of capillary flow in porous systems by tailoring the geometric shape of porous structures. A numerical simulation approach based on finite element method is also employed to validate the theoretical prediction. A basic capillary component with a tunable velocity gradient is designed according to the proposed framework. By using the basic component, two functional capillary elements, namely, (i) flow accelerator and (ii) flow resistor, are demonstrated. Then, multi-functional fluidic devices with controllable capillary flow are realized by assembling the designed capillary elements. All the theoretical designs are validated by numerical simulations. Finally, it is shown that the proposed concept can be extended to three-dimensional design of porous media. This entry was posted in Publications and tagged capillary flow, mechanics of interfaces, porous media. Bookmark the permalink. Post a comment or leave a trackback: Trackback URL.